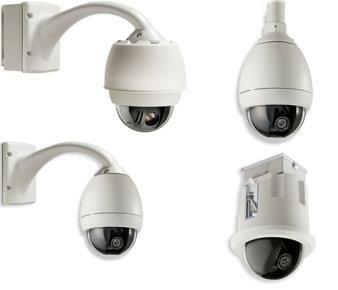 The AUTODOME Series cameras represent the latest advancements in video surveillance technology. The cameras ship fully assembled in a pendant or an inceiling housing. Bosch offers a host of mounts, power supply boxes, and accessories so you can tailor your installation for a variety of applications and environments. These items are sold separately so you purchase only the items you need, which saves money and simplifies purchases. 1. Dimensions include the mount and the connected pendant housings. 2. Dimensions for power supplies include the cover. Description Fiber Optic Ethernet Media Converter kit.Requires a small form-factor pluggable (SFP) module (sold separately). Installation Installed inside a VG4-A-PA1, VG4-A-PA2, VG4-A-PSU1 or a VG4-A-PSU2 power supply box, or in a MIC IP PSU, with supplied mounting hardware. Note: Wiring for the VG4-SFPSCKT must be routed through the proper conduit opening on the power supply box. Refer to the installation guide that accompanies the module.